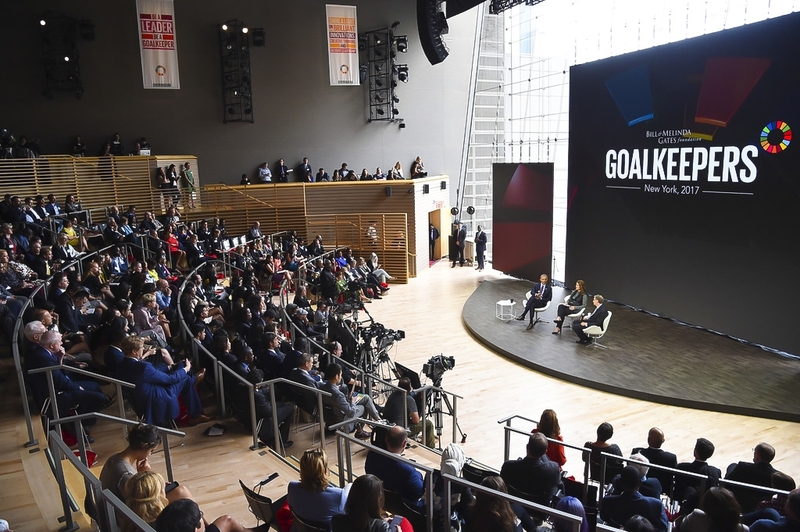 LD Fimbres and 4Wall Light First 'Goalkeepers' Event Hosted by the Bill & Melinda Gates Foundation | Press Center | 4Wall Entertainment, Inc.
New York, NY- The inaugural 'Goalkeepers' event, hosted by the Bill and Melinda Gates Foundation, took place last month at the Lincoln Center in New York City. Canadian Prime Minister Justin Trudeau, President Barack Obama, Nobel Peace Prize winner Malala Yousafzai, and more joined forces with Bill and Melinda Gates to engage a new generation of leaders in the fight against poverty and disease. 4Wall Entertainment provided the gear to Lighting Designer Mickey Fimbres for this momentous 2-day event. Fimbres' primary purpose of his lighting rig was the subtle, but very important white light wash for the cameras. "The producers at PeakXV didn't want a 'show'," explained the LD. "They wanted it to look as clean and simple on camera as possible." The event was streamed live globally and Fimbres needed to ensure every camera angle was evenly lit. "The huge challenge was the 50' × 83' wall of glass in the Appel Room," said Fimbres. "All of the daylight had to match the lighting onstage." The LD added a front truss made up of Martin MAC Viper Wash DX's and a rear truss with Martin MAC Aura XB's provided by 4Wall. "The Martin MAC Viper Wash DX is my go-to white, front light," explained Fimbres. "It's the ultimate corporate, camera front light. The color wheel has a 1/2 minus green, that when added with a little CTO, looks fantastic on camera." The Local 1 crew and production team played a key role in the success of the event and assisted Fimbres immensely. "Our biggest challenge was that we were overlapping another show," said the LD. "We had to load in at midnight, and sky our rig, then come back the following day at midnight to install the LED walls. The logistics of getting everything in and set was hard, but once in the room the crew made it easy." "I've been working with 4Wall and Jeff Mateer for several years now, and as the company has grown they've only gotten better," said Fimbres. I was skeptical when 4Wall started expanding, but as the company motto goes - 'Large Enough to Service, Small Enough to Care' - they truly stand behind that." See more of Lighting Designer Mickey Fimbres' work here: M93 Design.